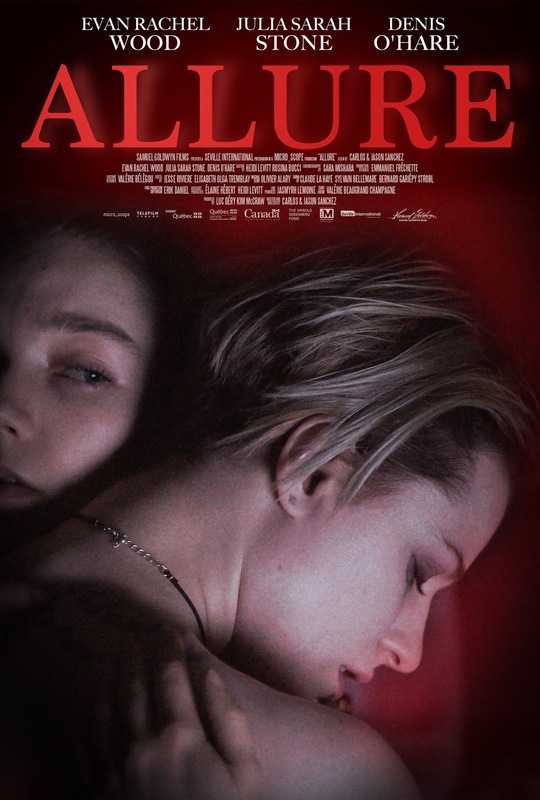 The movie Allure, starring Evan Rachel Wood as Laura, a house cleaner, and Julia Sarah Stone as Eva, a teenaged girl who is not incredibly happy with her life takes a deep dive into the complicated and illegal relationship between these two characters. This movie is meant to be about the cycle of abuse and how when it's not acknowledged by the abused and abuser can manifest in unfortunate and cyclical ways. While I understand that film doesn't always need to have a moral point to it, sometimes it can just be a painting of reality; and while I also understand the power in film and how it can help us to take on the experience of the other so as to, if anything, create a feeling of empathy where we can still find some ounce of humanity in people that have done horrible things, this movie left me with a not so good taste in my mouth when it comes to the way in which they deal with the topic of abuse. Laura is the poster child for an abuser; she manipulates, isolates, physically harms, sexually abuses, and lies to Eva. At some point in the movie we find out that Laura herself has experienced abuse in her own life. As you watch this situation unfold you will definitely get the feeling that the movie wants for you to empathize with Laura; the phrase "hurt people, hurt people" is truly magnified and is what is at the center of this story. However, through that creation of empathy all the way up to the movie's ending it feels as if the filmmakers are trying to diminish the fact that what is going on between Laura and Eva is not only illegal, but also, if I might add, disgusting. I applaud the filmmakers for making a film that created a sense of uncomfortableness in me all in the name of realism, and I also applaud Evan Rachel Wood for her portrayal of this monster; I think she does a great job in the role, but where is the line? Eva, never seems to ever question or be uncomfortable with what is transpiring except for one time in the movie. Perhaps this adds to the rebellious nature of her character at this point in her life and also shows her age as she naively goes along with everything that is going on. Laura, never seems to ever have any kind of conscious when it comes to this situation that she has put herself in. Yeah, she knows that what she's doing is illegal, but other than that she has no real other redeeming qualities that could even make us want to empathize with her character even if we wanted to. I think that's where my gripe with this movie lies is in the lack of consciousness on the part of the characters until the very last minutes of the movie. Had we been shown more internal conflict for these characters and even some consequences for their actions (we get none, by the way), then maybe, I could say that I would recommend this movie, but we don't, so I can't. I think that this movie is revolutionary in the sense that it is a female antagonist that is the abuser instead of it being a male, but overall this movie hits a sour patch for me that I can't really get over.